Welcome news to me. I'm very excited; sad I missed the last 12 years though:( They have an amazing pavillion. Not to mention two clay tennis courts (have to be a member to use them though). The 13th ANNUAL MOHEGAN COLONY STORYTELLING & MUSIC FESTIVAL will present an one hour Sneak Peek on FRIDAY, AUGUST 9 at 7:30 pm at EMBARK@EMC located on 925 South St (First Floor) in Peekskill. Reservations recommended: embarkpeekskill@gmail.com - only 75 seats! FREE for Children 12 & under. Suggested Donation per Person: $5. And the ALL DAY FESTIVAL will take place on SATURDAY, AUGUST 10 from 10 am - 10 pm at Mohegan Colony's Pavillion located at 99 Baron De Hirsch Rd, Crompond, NY (off Lexington Ave). Ticket price including Free Parking: for Adults is $20 for all day and night; children $5; Adults $15 for just day, child $3.00; Adults: $10 for "Twilight Tales/Ghost Stories," Child. $3. Twenty ($20) for morning workshop. Reservations for all segments of the festival are recommended. Family and Home School rates. 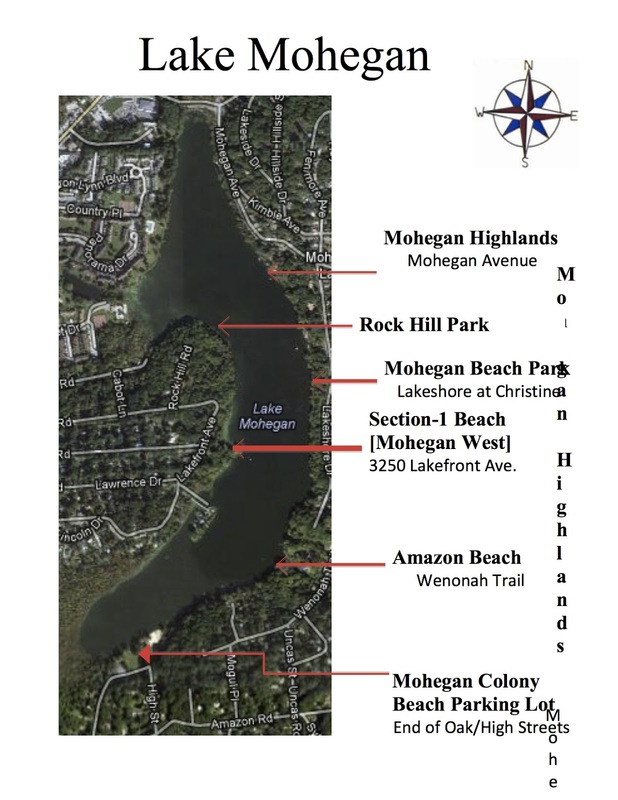 The Mohegan Lake Improvement District will be meeting this Thursday night August 1st at 7:30 P.M. in the kitchen of the Mohegan Colony Schoolhouse at 99 Baron de Hirsch Road in Crompond. We will be discussing the state of the lake, and particularly the County and State Health Department's position on what triggers closing of a beach or the lake as a whole to swimming. We will also be reviewing the remaining activities for the year to address water quality, and planning for next year's permit application to apply Alum to the lake. We would like to hear from as many residents and beaches around the lake as possible, to help set our priorities. Hope to see you there! If you're not up to speed on Mohegan Lake's residential community's struggle to reign in the massive new development proposed for Faith Bible Church, you can get some background information here. We're not against the church and don't oppose the use, it's a practical opposition to the site's deficiencies relative to the proposed enlarged occupant load. Specifically that they have already enlarged the church, illegally, and seem to have done so to the limits of the area they can adequately provide legal parking spaces for. At the last public hearing in May for variances the church is seeking, I correctly noted that the building inspector had unequivocally noted that the two residences they church owns were converted to church use without approval or permit. After nearly 5 years the Faith Bible application has been before both the planning and zoning boards, the church and their attorney--Al Capellini--have never contested the documents in the planning and zoning files that clearly demonstrate that they have already enlarged the legal occupancy and parking exponentially. The building inspector's memo in both board files correctly notes that the church has already enlarged "without approval or permit," which is a nice way of saying illegally. But wait! Acting chairman of the zoning board Gregg Bucci (because the actual chairman of the board has to recuse himself because he has a "counsel relationship" with--wait for it...--Al Capellini) has an argument to make for the applicant. Just because there is no "record" of an application, approval or permit for the change to church use and increase the parking load since 2005, when the applicant took title of the premises, that doesn't mean the records weren't lost or stolen or misplaced. Dear reader, the video below is not theater of the absurd. This is our Zoning Board of Appeals in action. According to Mr. Bucci's reasoning, your neighbor can legitimately--it would seem--claim that they didn't illegal convert or build the structure next to your house. The problem is that the approval and permit was lost, or stolen, or misplaced. The onus of proof of existing occupancy, use and parking conditions is not placed on the applicant; Yorktown places the onus on neighbors of the applicant to prove that Yorktown records are complete? The landowner making application and the planning department, planning and zoning boards can just invent their own narrative--arbitrarily?! Last note: at the end of the video, please note that I literally LOL at Mr. Bucci's assertion that perhaps they didn't do it illegally. Perhaps I stole the records and perhaps there's no collective memory of any such conversion in the neighborhood and perhaps Yorktown governmental records. Perhaps. Gentle reader, don't forget you can put your bulk trash out tomorrow in section 1, which is most of Mohegan Lake. Don't forget that Lake Day is This Sunday! Click here for the schedule and map. Here's a video of our weed harvester in action last Monday. Thanks to our lake manager, Wayne, for nursing her back to health. Glad to see her doing work again. Sunday July 14 will be that time of year again when we celebrate one of Yorktown's natural treasures: Mohegan Lake. 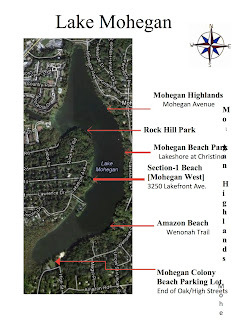 Below is the the official Mohegan Lake Improvement District press release and schedule; attached is a map of our Lake's beaches. There will be lots of fun, family activities, food, drink and informative presentations all day long. Oh yeah, and boat races; a regatta if you will. Section 1 Beach (Mohegan West) -3250 Lakefront Ave. Simultaneous Ocupancy: "It's for a growth pattern." There was a lot of new information at the Zoning Board of Appeals meeting for Faith Bible Church on 6/27. There were some amazing revelations too. For example: I'm not crazy. I've been jumping up and down, screaming that it's incredibly wrong for the Planning Board to consider the ENTIRE first floor of the new church as "non simultaneous occupancy." It's literally a made up concept; they can't cite any reference to it in our code or zoning, yet the town has been entertaining it. I recommend that you try and catch a rerun of the hearing. It is repeated on channel 20 Cablevision until the next hearing on 8/8/13; the video is clocked and the hearing runs approximately 8:15pm to 10:15pm (note: ZBA meetings are replayed at various times throughout the day, not just at that time). To begin my commentary on the last zoning meeting meeting, I present to you a segment of reverend Zotolli explaining the occupancy of the proposed church. He clearly states that the occupancy of the 2nd floor sanctuary, of up to 344 people, would be simultaneous with the 1st floor children's church program. There's nothing wrong with that, except that for years they have been arguing, on signed and sealed documents, that the 1st and 2nd floor would be "non-simultaneous occupancy." That's a big deal because it proves the applicant's willingness to bend the law and make false statements. The stated goal of the new development is enlargement. The land simply can't sustain the parking required for the proposal. For the record: Lakeland Jewish Center moved on and built nearby in a Commercial zone with tons of parking and a smaller occupant load than Faith Bible is proposing. Just make it smaller if you want to use this site. Why not look at the 5 acres across from the winery; for sale, off route 6 and in a residential zone? Unfortunately, things can never be that simple.